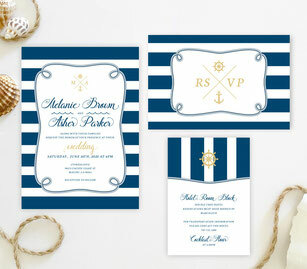 If the ocean breezes and open sea beckons to you, a nautical wedding theme may be just the perfect thing for you. 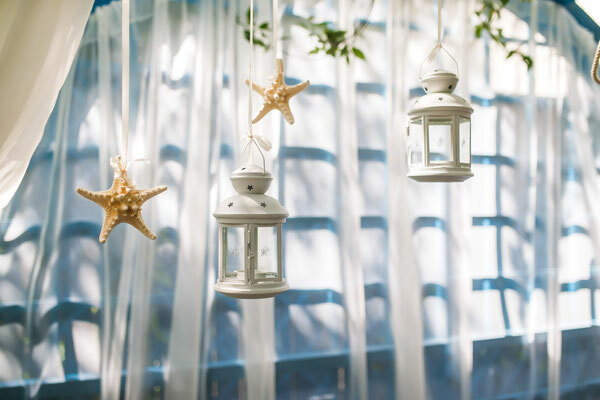 There are many unique ideas for decorations, planning and the ceremony. Imagine a gazebo standing on the beach, decorated with flowers and ribbons, surrounded by rows of seats with loving family and friends. You can decide if you want your wedding on land or sea. 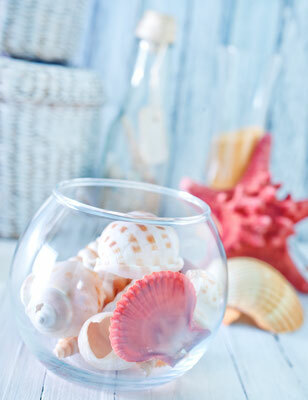 Explore renting a Yacht or ship for the wedding and reception. Check any coastal locations such as Washington, Oregon, California, Mexico, Texas, Florida and the Eastern Seaboard for detailed suggestions or maybe the French Riviera or Australia. The world is yours. Again, there are wedding planners who have access to all types of venues and may be able to make some recommendations. Remember to check customs and requirements in foreign countries to make sure you have all the proper documentation. If you are staying on land, your planner can help take care of any reservations for the area and permits that are required. Now comes the fun part. It’s time to start thinking about decorations, the actual ceremony and reception, food and beverages. Research and study some nautical traditions and ideas that may appeal to the two of you. The Fisherman’s Knot is sometimes used in wedding ceremonies as a symbol of the strength of your love and unity. You can find examples of how to accomplish this on line. 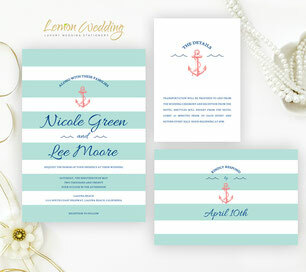 Lemon Wedding Invitations has a great selection of appropriate styles to announce your Nautical Wedding. View our Anchor, Seashell or Starfish sets or one of our Beach settings. Choose your colors and themes or you could go more formal with set from our Lace Invitations, the rich Navy-Blue Damask or Navy Blue and Silver. 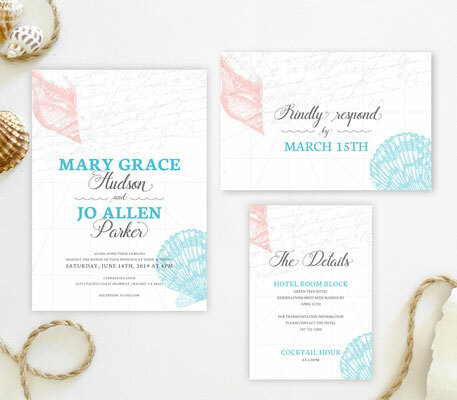 Select your colors and special wording and let our professional designer help you create the perfect selection of Invitations, RSVP Cards, Detail Cards and even your wedding programs. This is what we love to do. Your wedding is the most important thing to us. 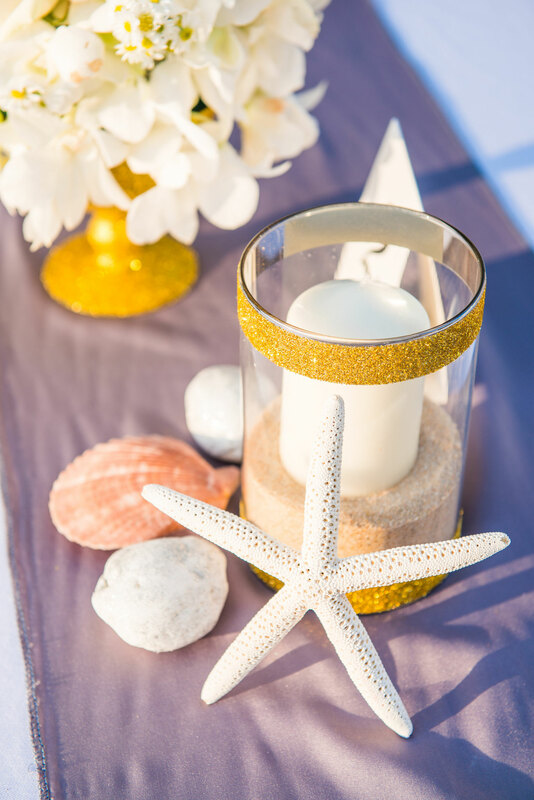 Our designs are unique and works of art that will highlight just how special your wedding will be. Let us help you accomplish this for a reasonable price in record time, 100% guaranteed. This will be one of the easiest parts of planning your wedding. Look through our website and read our customer reviews. Choosing a Wedding Invitation Set with the Invitation, RSVP card and Details card is a smart and budget-friendly way to go. 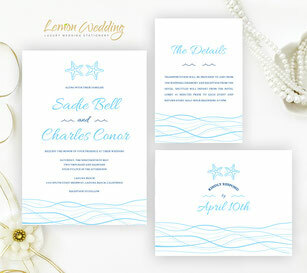 You will not be disappointed by invitations on our pearlescent or luxury papers. 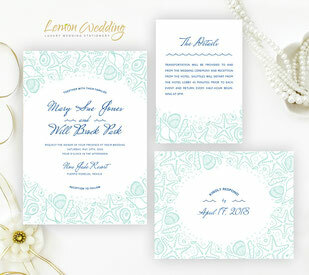 While you are out shopping for your dress, we will be creating your impeccable invitations sets. You and your Fiancé can plan a wonderful day to explore the ceremony area ahead of time and imagine how it will look and feel. 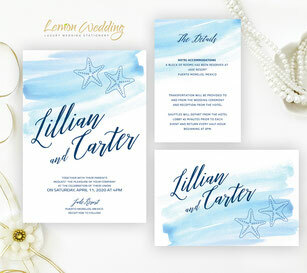 Your guests will be intrigued and delighted with your plans and that will start the minute they receive your beautiful Nautical Wedding Invitation. When guests arrive on your day, let us help you provide them with a beautifully designed matching Wedding Program containing an Advice Card for them to fill out and leave for you. They will enjoy deciding just what piece of wisdom to share with you and you will treasure these memories for the rest of your lives. That is what Lemon Wedding is here to do. This is our way of giving you the best on your most important day. We can’t wait to hear from you and get started. 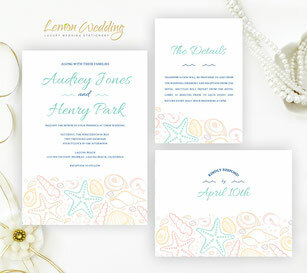 Starfish wedding invitations, Seashell wedding invitations.